Members may well have read my comments about the standard of journalism in my local read. It’s awful, it’s been awful for years and unfortunately it’s going to be awful for many years to come. This is a scan of the main story on the back page of today’s E.P.Herald. Thankfully I only buy the thing for the DT cryptic crossword. I wonder how Mr Ogden feels about this? 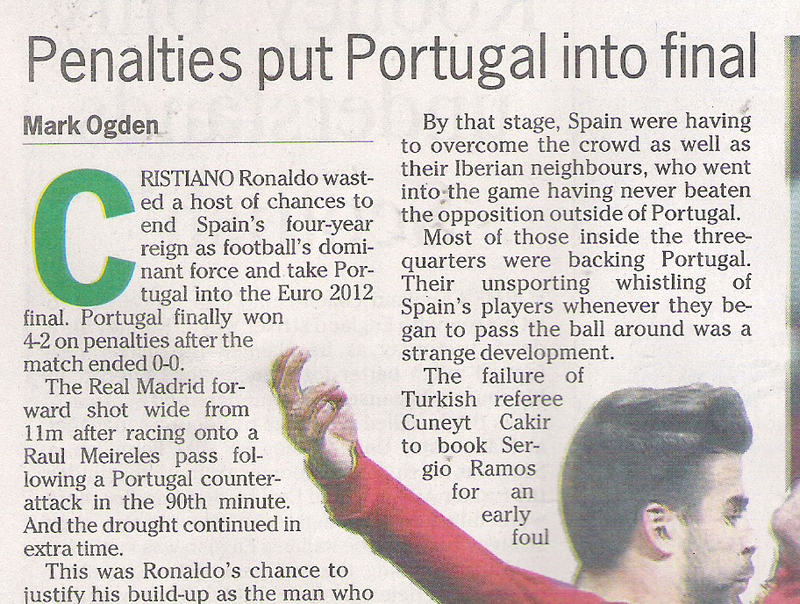 For the record it was Spain who won 4-2 on penalties to send Portugal packing. Author SoutiePosted on June 28, 2012 Categories Humour, SportTags CR7, E.P.Herald, Euro 2012, football, Humour, Mark Ogden, penalty shoot out, Portugal, Ronaldo, Spain7 Comments on Portugal win !